If you sign up for DsTV boxoffice online account, to have access to latest movies via your PC or Mac, you will need to make use of the DStv Desktop Player if you would prefer to download the movie you rent and watch it later. 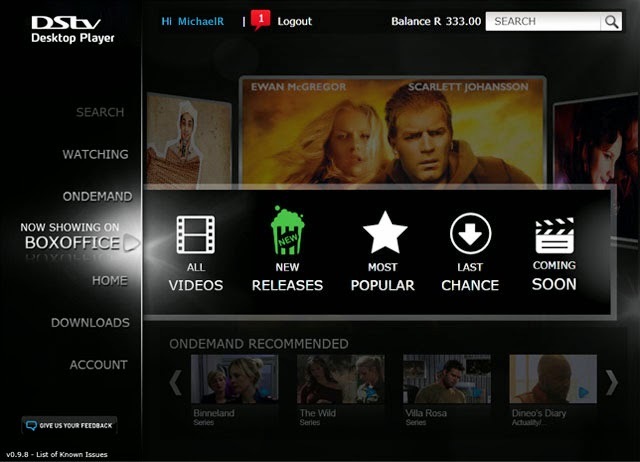 Once you have installed the DStv Desktop Player, you will be able to browse and search for movies in the BoxOffice catalogue. All you just need to do is to select your movie, click “Rent”, select your payment method and your movie will begin downloading to your computer. Once it has finished downloading, your movie will be available to watch on your computer in the DStv Desktop Player, even if you disconnect from the internet. * Note – you will require a connection to the Internet to download your movie. Movies downloaded will be will be available to you for 48 hours from the moment that you press the"“Watch Now" button. Right there, you can click on the "check now" button to verify if you can use your computer to rent and download movies with DsTv Boxoffice. The streaming service is currently available to anyone in SouthAfrica. Hence, you might not be able to download the desktop player if your are not in SouthAfrica. Mircosoft Silverlight runtime 5.1.20913.0 is also needed to run the desktop player. If you have the DStv Desktop Player already installed on your computer and decide to upgrade to the latest version, you must not uninstall the old version. If you do, all previously-downloaded content may be lost. If you install the newest version of DStv Desktop Player BETA onto your computer without un-installing the previous player, you will have two different versions of the player on your computer. Content downloaded with one player will not be playable on the other.